my initial plan was to forget the beads. i wasn’t sure i liked the idea and that would just mean another purchase. 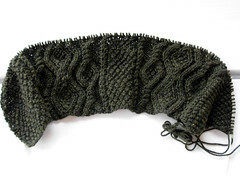 so i cast on, several days after the kal began and made it to row 40, no problems. i was a +1 charts behind when clue 2 came out, no big deal, still plenty of time to catch up. except on saturday, i found myself waaaay too close to the local jo-ann etc. and the beads waaay to tempting. i ended up frogging the whole thing–a slight challenge in laceweight alpaca, but not insurmountable–and starting over with beads. the beads are a blue/purple/blue-green blend that goes well with the subtle variegations of the yarn. they might be a tad too big, but i think they’ll be ok.
as penance for my impulsiveness (and further explanation as to why i’ve only subsequently made it to row 44) i’ve returned to my cardigan. the back is still a bit wider than it should be (for reasons completely beyond me – the fronts were both perfectly sized.) but i’ve given up and decided that this is perfectly fine. finishing is now more important than width precision. width can disappear when the sweater is made up. it’s coming along fairly nicely – maybe i’ll get it done this summer after all! Oh, both projects on your needles are coming along so beautifully! I can’t wait to see how the beading turns out in the stole, and that cardigan – wow, this is going to become a real piece of art, what a beautiful pattern!